You localize text for your apps using localizable strings created with the UserGuide:Constant Editor:Constant Editor. These are a special form of a constant that is added to a project item such as a module, window, web page or class. Only constants of type String or Text can be marked as localizable. When the constant is localizable, it can have different values to use for localization. To identify a constant as localizable, create a String or Text constant and then enable the Localizable switch in the Inspector. A recommended approach is to create a separate module for these localizable strings, but you can put them anywhere that is publicly accessible. You can enter different localized values for the string based on platform and language. Do this using the UserGuide:Constant Editor:Constant Editor. Use the “+” and “-” buttons to add or remove a specific localization. You can choose the Platform and the Language for which to specify a value. When the user runs an app, the language specified on their system is used to look up the localized value of the string to use. s = kHello("fr") // s = "Bonjour"
s = kHello("en") // s = "Hello"
s = kHello("en_UK") // s = "Welcome"
On the Shared Build Settings, there is a Language property in the Build section of the Inspector. This property determines the language that is used by any localized strings that have “Default” as the language. It is important that you select a specific language in this build setting. If you also leave this setting at “Default”, you will run into confusion if the project file is shared with people that do not have the same system language as you. For example, if you leave both the localized string language and build language as “Default” then “Default” becomes “English” for users that build with an English system and becomes “French” for users that build with a French system. To prevent this confusion, always at least choose a specific language in the Build setting. Alternatively, don’t use “Default” for your localized strings and instead always choose the exact language for them. If you have a lot of text to localize, it can get tedious to enter all the values using the Constant Editor. The Lingua app is used to simplify the localization process. With Lingua you can localize your app strings outside of the project by using the localized strings you have already created. Refer to the Lingua topic to learn more. You can localize how dates and numbers are displayed by using the Xojo.Core.Locale class. The shared Current method returns the locale that is specified in the system or device settings. You can then use this with the ToText method on Xojo.Core.Date, Double and Integer to display values formatted properly for the locale. Web apps can also localize their text using dynamic constants, but the language that is displayed is determined by the language setting in the browser being used to access the web app. More specifically, it is using the constant value that is most appropriate for the HTTP header language setting of the current session. In desktop apps, you can use Xojo.Core.Locale to get the user's locale for formatting dates and numbers. However, in a web app this value returns the locale used by the web server rather than the locale of the current user session. Which returns both the language and region code in a format like this: en-US. Note that there may be more than one value returned in this header so you may need to parse it to ensure you get the value you actually want. 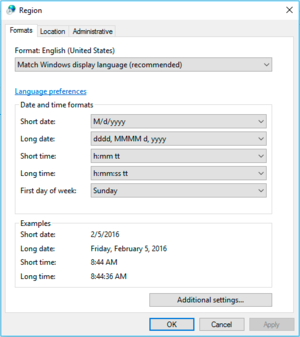 To use a different language on Windows, you need to change the Language setting on the Format tab of the Region control panel. Changing the Language on the Keyboard and Languages tab will not affect your applications. 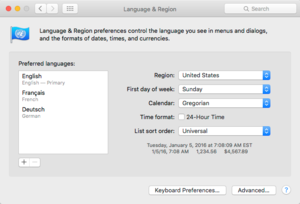 In "Related Settings", click "Additional date, time & regional settings"
In the Region section, click "Change location"
To change the language on Mac, open System Preferences and select "Languages & Region" (top row). In the list of Preferred languages on the left, you can drag the language you want to be the primary language to the top. The specific way to change the language and region varies by Linux distribution. 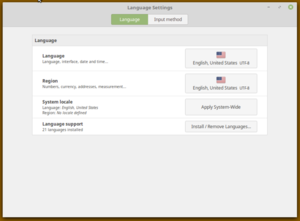 On Linux Mint 18, you can make the changes by going to Preferences ↠ Languages and making the appropriate changes. 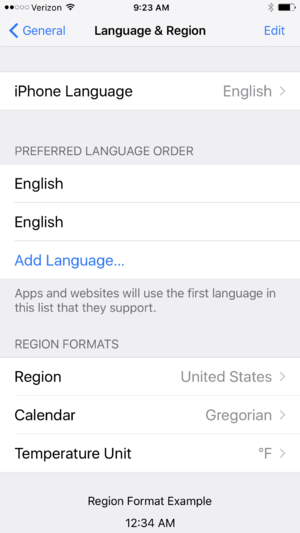 To change the language on iOS, open the Settings app and select General, followed by "Language & Region". On this screen you can change the preferred language order and region formats. To see a web app in a different language, you'll need to change the settings for the browser that is connecting to the web app. This varies by browser. Edge Uses the system settings in Settings / Control Panel. Internet Explorer Go to Internet Options. In the General tab click the Languages button to display the screen to set the language. Safari Uses the system settings in System Preferences. Chrome Go to Settings and then click Advanced settings. Look for the Languages section. Firefox Go to Preferences, select Content and look for the Languages section. This page was last edited on 7 February 2019, at 16:36.